The Prague Metro (Czech: Pražské metro) is the rapid transit network of Prague, Czech Republic. Founded in 1974, the Prague Metro now comprises three lines (A, B and C), serving 61 stations (predominantly with island platforms), and consists of a transit network 65.2 kilometres (40.5 mi) long. Prague Metro system served 589.2 million passengers in 2012 (about 1.6 million daily), making it the fifth busiest metro system in Europe. Two types of metro trains are used on the lines of the Prague Metro: 81-71M (a completely modernized variant of the original 81-71) and from 2000 new Metro M1. All the lines are controlled automatically from the central dispatching, near I.P. Pavlova station. 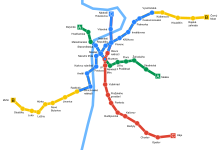 The Prague Metro has three lines, each represented by its own colour on the maps and signs: Line A (green, 17 stations, 17 km), Line B (yellow, 24 stations, 26 km) and Line C (red, 20 stations, 22 km). There are 61 stations in total (three of which are transfer stations) connected by nearly 66 kilometres of mostly underground railways. The metro service operates from 4-5 am until midnight, with about 110 to 200-second intervals between trains and 4-10 minutes off the rush hours. Nearly 600 million passengers use the Prague Metro every year (about 1.6 million daily). The metro is run by the Prague Public Transit Company Co. Inc. (in Czech, Dopravní podnik hlavního města Prahy a.s.) which manages all means of public transport around the city (the metro, tramways, buses, five ferries, the funicular to Petřín Hill and the chairlift inside Prague Zoo). Since 1993, this system has been connected to commuter trains and buses and also to "park-and-ride" parking lots. Together they form an extensive public transportation network reaching further from the city, called Prague Integrated Transport (in Czech Pražská integrovaná doprava—PID). Whilst the large system is zonally priced, the metro is entirely inside the central zone. Many Prague Metro stations are quite large, with several entrances spaced relatively far apart. This can often lead to confusion for those unfamiliar with the system, especially at the central hubs such as Můstek or Muzeum. In general the stations are well signposted even for those unfamiliar with the Czech language. The Prague Metro is very safe. The Prague Metro system is laid out as a triangle, with all three lines meeting in the centre of the city at three interchange stations. Each interchange station has two halls, one hall for each line. The depth of the stations (and the connecting lines) varies considerably. The deepest station is Náměstí Míru, located 52 metres (171 ft) under the ground. Parts of the tracks in the city centre were mostly bored using the tunnelling shield. Outer parts were dug by the cut-and-cover method and the stations are only a few metres under the surface. Part of Line B runs in a glassed-in tunnel above the ground. Most stations usually have a single island platform in the centre of the station hall (tunnel) serving both directions. The sub-surface stations have a straight ceiling sometimes supported by columns. The deep-level stations are larger tunnels with the track tunnels on each side. The walls of many stations are decorated using coloured aluminium panels; each station has its own colour. Some stations are considered among the finest in Europe. Service is provided entirely with two kinds of five-car units. Prague Transport Company (DPP) currently owns 265 units of type M1 and 465 units of type 81-71M. Metro M1 has served on line C since 2000; it completely replaced older cars on this line in 2003. The metro sets were developed specially for Prague. Prague Transport Company (DPP) owns 53 units of this type. These units were manufactured in Prague by a consortium consisting of ČKD Praha, ADtranz and Siemens (during the contract Siemens acquired ČKD Praha) mainly between 2000 and 2003. The length of the unit is 96.66 metres, acceleration is 1.3 m/s, and the capacity of the set is 1,464 people (224 sitting, 1,240 standing). This unit was also adapted for use in Venezuela on the Maracaibo Metro. 81-71M is a modernized variant of the old Soviet 81-71 trains with a new engine, technical equipment, interior and exterior. It has served on line A and line B since 1996. The modernization was conducted by Škoda Transportation and ČKD between 1996 and 2011. Prague Transport Company owns 93 units 81-71M. The length of the unit is 96.11 metres, acceleration is identical to Metro M1, 1.3 m/s. Similar reconstructions were also made in the Tbilisi metro and Yerevan metro, as well as a near-identical version exported to Kiev from Metrowagonmash as part of the Slavutich project, designated 81-553.1, 81-554.1 and 81-555.1. 81-71, old Soviet trains manufactured by Metrovagonmash were gradually phased out and replaced by the modernized versions. Their service ended on 2 July 2009. One vehicle is stored in the Museum of Prague public transport, while one fully operational unit of five cars stays in the Zličín (B) depot for special occasions. Ečs, Soviet trains manufactured by Metrovagonmash, that ran on line C, in service from 1974-1997. One vehicle is also stored in the Museum of Prague public transport, while one fully operational unit of three cars is stored in the Zličín (B) depot. Ladislav Rott's proposal to the Prague City Council. Although the Prague Metro system is relatively new, the idea of underground transport in Prague dates back many years. The first proposal to build a sub-surface railway was made by Ladislav Rott in 1898. He encouraged the city council to take the advantage of the fact that parts of the central city were already being dug up for sewer work. Rott wanted them to start digging tunnels for the railway at the same time. However, the plan was denied by the city authorities. Another proposal in 1926, by Bohumil Belada and Vladimír List, was the first to use the term "Metro", and though it was not accepted either, it served as an impulse for moving towards a real solution of the rapidly developing transport in Prague. In the 1930s and 1940s, intensive projection and planning works were being held, taking into account two possible solutions: an underground tramway (regular rolling stock going underground in the city center, nowadays described as a "pre-metro") and a "true" metro having its own independent system of railways. After World War II, all work was stopped due to the poor economic situation of the country, although the three lines, A, B and C, had been almost fully designed. In the early 1960s the concept of the sub-surface tramway was finally accepted and on 9 August 1967 the building of the first station (Hlavní nádraží) started. However, in the same year, a substantial change in the concept came, as the government, under the influence of Soviet advisers, decided to build a true metro system instead of an underground tramway. Thus, during the first years, the construction continued while the whole project was conceptually transformed. Regular service on the first section of Line C began on 9 May 1974 between Sokolovská (now Florenc) and Kačerov stations. Since then, many extensions have been built and a number of lines has risen to three. On 22 February 1990, 13 station names reflecting mostly communist ideology were changed to be politically neutral. For example, Leninova station, which contained a giant bust of Vladimir Lenin before the Velvet Revolution, was renamed Dejvická after a nearby street and surrounding neighbourhood. Other changes were: Dukelská - Nové Butovice, Švermova - Jinonice, Moskevská - Anděl, Sokolovská - Florenc, Fučíkova - Nádraží Holešovice, Gottwaldova - Vyšehrad, Mládežnická - Pankrác, Primátora Vacka - Roztyly, Budovatelů - Chodov, Družby - Opatov, Kosmonautů - Háje. A number of stations were closed due to the flooding in June 2013. Replacement buses ran between Dejvická and Muzeum on line A, Českomoravská and Smíchovské nádraží on line B and Kobylisy and Muzeum on line C due to closed sections of the track. After the regular service on the first section of Line C began in 1974 between Florenc and Kačerov, building of extensions continued quite rapidly. In 1978 the second Line A was opened and the third Line B opened in 1985, thus forming the triangle with three crossing points. Since then, the lines have been extended outwards from the center. In 1980 and 1990, Line A was extended from Náměstí Míru to east to the terminal stations Želivského and Skalka. Line B was extended from Nové Butovice to Zličín in 1994, from Českomoravská to Černý Most in 1998, Kolbenova and Hloubětín stations were opened in 2001. Expansion of the Line C was carried out in 1980 (Kačerov - Háje) and 1984 (Florenc - Nádraží Holešovice). A northern extension of Line C was opened on 26 June 2004, with two more stations, Kobylisy and Ládví. New tunnels were built under the Vltava river using a unique "ejecting-tunnels" technology. First, a trench was excavated in the riverbed and the concrete tunnels constructed in dry docks on the riverbank. Then the docks were flooded, and the floating tunnels were moved as a rigid complex to their final position, sunk, anchored and covered. Line A was extended to the east on 26 May 2006, when a new terminus, Depo Hostivař, opened. The station is constructed within the railway depot. Line C was extended to the northeast to connect the city center to the housing blocks at Prosek and a large shopping center at Letňany. Three stations (Střížkov, Prosek and Letňany) opened on 8 May 2008. In April 2015, Line A was extended westwards from Dejvická to Nemocnice Motol with four new stations: Bořislavka, Nádraží Veleslavín, Petřiny, and Nemocnice Motol. The Nádraží Veleslavín station is also the new terminus of the 119 bus to Václav Havel Airport. Another phase of the extension of Line A was planned from the Nemocnice Motol to the Václav Havel Airport, but it is very likely that this extension won't be built and the airport will be serviced by a new railway instead. It is planned to build a new line, Line D (blue line), which will connect the city centre to southern parts of the city. According to current plans, the line will start in the center and will lead to Vršovice, Krč, Libuš and Písnice. There will be 10 stations: Náměstí Míru (transfer to line A), Náměstí bratří Synků, Pankrác (transfer to line C), Olbrachtova, Nádraží Krč, Nemocnice Krč, Nové Dvory, Libuš, Písnice and Depo Písnice. Metro D is very important for improving the traffic situation in the southern and southeastern part of the city. In the second stage it is planned to extend this line from Pankrác to Náměstí Míru (Peace Square). The first part of Line D is planned to be built between 2019 and 2023. There are also plans to line E, which will probably be circular. The exact route has not yet been determined. In the beginning of the 21st century, there were discussions regarding it in the connection with plans to organise the Summer Olympic Games in Prague, which were however canceled. The name of station "Můstek" means "little bridge" and refers to the area around the Můstek station. The origin of the area's name was not known until remains of a medieval bridge were discovered during construction of the station. The remains were incorporated into the station and can be seen near the northwestern exit of the station. The escalator at Náměstí Míru (Peace Square) station in Vinohrady is the longest escalator in the European Union (length 87 m, vertical span 43.5 m, 533 steps, taking 2 minutes and 15 seconds to ascend). Náměstí Míru is also the deepest station of the European Union (53 metres). Between I. P. Pavlova and Vyšehrad stations, Line C runs inside the box structure of the large Nusle Bridge over a steep valley. The terminal station Depo Hostivař was constructed within the buildings of an existing railway depot. The extension is the first segment of the system to be built above ground and not through a tunnel. This station is also interesting that there are not reversing tracks and the train departs from the same track on which arrived. Anděl station was known as Moskevská (Moscow Station) until 1990. It opened on the same day in 1985 as the Prazhskaya (Prague) station on the Moscow Metro. It contains several pieces of art promoting Soviet-Czechoslovak friendship. Anděl station, like the Smíchov train station, contains some of the best-preserved examples of Communist-era art remaining in Prague. The entrance hall of the Hradčanská station still features the coat of arms of Czechoslovak socialist republic and the motto Všechna moc v Československé socialistické republice patří pracujícímu lidu ("All the power in the Czechoslovak socialist republic belongs to the working people") which were parts of the station's original socialist-realist design. During the communist period rumours circulated that large "survival chambers" were being built for high officials of the government in the case of a nuclear attack. After the fall of communism such areas were shown indeed to exist, but not on the scale envisioned nor fitted out in luxury. The Prague Metro operates on a proof-of-payment system, as does the entire Prague Integrated Transport (PID) network. Passengers must buy and validate a ticket before entering a station's paid area. There are uniformed and plainclothes fare inspectors who randomly check passengers' tickets within the paid area. Basic single tickets cost 32 CZK (as of 5 February 2019) for a 90-minute ride or 24 CZK for a 30-minute ride. In November 2007 SMS purchase for basic single transfer tickets and day tickets was introduced. Short-term tourist passes are available for periods of 24 hours (110 CZK) and 3 days (310 CZK). Longer-term season tickets can be bought on the smart ticketing system Lítačka card, for periods of one month (550 CZK), three months (1480 CZK) or the annual pass for 3650 CZK (10 CZK/day). Students studying in the Czech republic with a valid student license ISIC, children under 18 years old and seniors over 60 years of age can buy season tickets at reduced prices. Reduced ticket prices are: 130 CZK for 30 days, 360 CZK for 90 days or 1280 CZK for a year. The tickets are the same for all means of transport in Prague (metro, trams, buses, funiculars and ferries). The announcement made through the public address system when the doors are closing, "Ukončete, prosím, výstup a nástup, dveře se zavírají" ("Please finish exiting and boarding, the doors are closing") has become a symbol of Prague for many tourists, and is possibly the first clear Czech phrase many travelers hear. The announcement has been similar since 1974, when the first line of metro was opened, although the original version did not include the word "please". The announcements voiced on line B: Eva Jurinová, on line A: Světlana Lavičková and on line C: Tomáš Černý. Other announcements include: "Vystupujte vpravo, ve směru jízdy" ("Exit on the right side in the direction of travel"), "Konečná stanice, prosíme, vystupte" ("Terminal station, please exit the train") and "Přestup na linky S a další vlakové spoje" ("Transfer to S lines and other train services"). ^ a b c d e f "Company Profile - Dopravní podnik hlavnívo města Prahy". Dopravní podnik hlavnívo města Prahy. Retrieved 3 July 2015. ^ a b "Annual Report 2012" (pdf). DPP.cz. Dopravní podnik hlavnívo města Prahy. 2012. p. 66. Retrieved 20 September 2013. ^ a b c d e f "History - Dopravní podnik hlavnívo města Prahy". Dopravní podnik hlavnívo města Prahy. Retrieved 11 September 2013. ^ a b c d Tomáš Rejdal. "Linka A". metroweb.cz (in Czech). Retrieved 6 April 2015. ^ a b c "Metro". Praha.eu. Archived from the original on 1 February 2014. Retrieved 18 January 2014. ^ "Historie metra ve zkratce dle jednotlivých let". Metroweb.cz. ^ "Povodně 2002: Voda zaplavila 18 stanic metra, zavřela je až na půl roku". iDNES.cz. 14 August 2012. ^ "Prague authorities close metro stations amidst fears of flooding". Radio Prague. 2 June 2013. Retrieved 7 January 2014. ^ "Another 4 metro stations closed over floods in Prague". Prague Monitor. 4 June 2013. Retrieved 7 January 2014. ^ a b c d "Prague (Praha) Metro". Urbanrail.net. ^ "Metrostav - Completed projects". Metrostav.cz (in Czech). ^ "Permanent Changes to the PIT System as of the 7th April 2015". Dpp.cz. ^ "Přestup na Pankráci s novou tváří. Za pár měsíců se může stanice úplně změnit | Doprava". Lidovky.cz. 13 June 2017. ^ "Company". ThyssenKrupp Elevator. Retrieved 24 October 2013. ^ "Novelty on Prague transport system: tickets by SMS". Radio Prague. 22 November 2007. Retrieved 7 January 2014. ^ HLASY Z METRA I VLAKŮ: ČÍ JSOU? Wikimedia Commons has media related to Prague Metro. Prague Public Transit Co. Inc. –official site including maps, fare information, etc. This page was last edited on 11 April 2019, at 03:19 (UTC).